- Savor the hearty flavor and delicious crunch of Snyder's of Hanover pretzels. 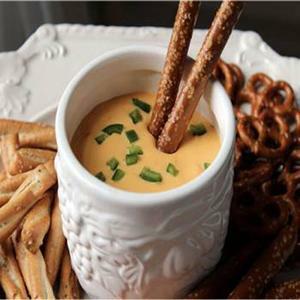 - A classic taste and a shape that is sure to be a perfect accompaniment to your favorite mustard or cheese dip. For generations, our pretzels have been shared across tables, across generations, and across the world. Since our original Olde Tyme Pretzels were first baked in 1909, our products have made waves for their quality, value, and unique taste. As we continue to celebrate the efforts and innovations of our predecessors and their families, we also strive to meet the changing tastes and needs of our consumers today. At Snyder’s of Hanover, we look forward to many more years of pretzel pride as one of America's favorite pretzels. We proudly run the largest pretzel factory in the country, along with the largest solar farm in PA. It powers 100% of our R&D center and 30%+ of our manufacturing facility in Hanover! And as of 2016, it is officially a peanut-free facility, ensuring the safety of our consumers with severe allergies. Perfect for parties, lunch boxes, or a health-conscious snack - our pretzels suit your every need. Every pretzel is made with non-GMO ingredients, plus we have organic and gluten-free options. No matter which is your favorite, Snyder’s of Hanover pretzels give you that delicious crunch you love! Scoop out 1 container of cheese spread into a mound onto the center of a plate. 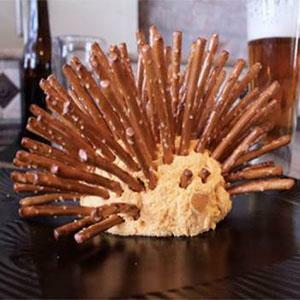 Push Pretzel Sticks all around cheese mount, leaving a little areas for the face. Break both tips of a Pretzel Stick off and push in the cheese mound as eyes. Keep refrigerated until ready to serve. Place Snaps on baking tray lined with parchment paper. 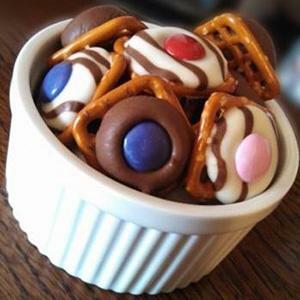 Top each pretzel with one large chocolate drop candy and bake in 200F oven for 4-5 mins to soften chocolate. Remove from oven and press a candy coated chocolate on the center of each. Put tray in refrigerator for 5 mins to set chocolate. Combine ¼ c stout, ¼ c Dijon mustard, 2 tbsp. butter, and ½ tsp cayenne pepper in a saucepan on medium heat, mix well. Gradually add 16 oz. bag of shredded cheddar cheese in 1 cup batches. Whisk until it’s smooth and has reached desired thickness. Remove from heat and stir in 1 minced jalapeno.